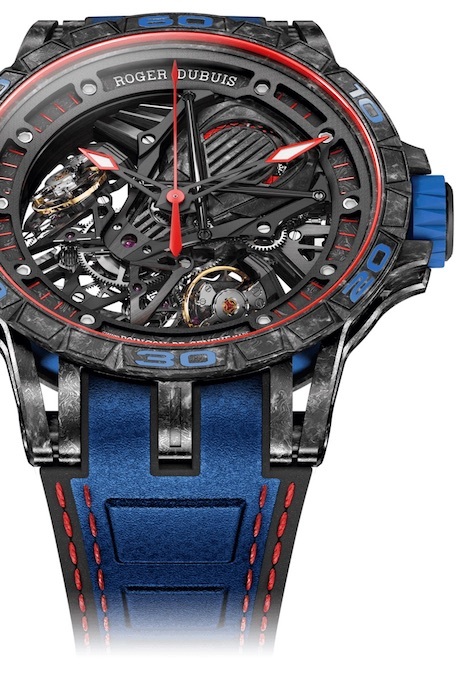 The exciting world of motorsports has always provided ample inspiration for Roger Dubuis. Case in point: last year the Geneva watchmaker — known for bold and disruptive craftsmanship — released a double flying tourbillon with F1 tiremaker Pirelli. Though highly anticipated, that watch proved relatively inaccessible, limited to a production total of just 8 pieces. 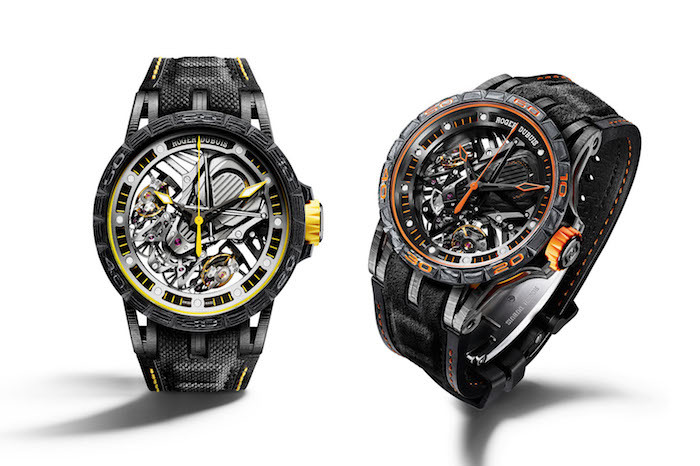 Fortunately, for SIHH 2018, Roger Dubuis debuted two slightly more attainable models, releasing under the umbrella of the brand’s (permanent) Excalibur collection. Made in partnership with Lamborghini Squadra Corse, these watches deepen the brand’s reputation for motoring-themed horology, and are no doubt guaranteed to go over a treat with supercar enthusiasts. Pictured: the initial Lamborghini Aventador S releases in yellow and orange colourways. The first Lamborghini themed addition to the Excalibur collection is the Aventador S: named for the Italian carmaker’s mid-engine flagship. Previously released in eye catching orange and yellow, the Aventador S is now available in two additional colourways — blue and pink gold. As with the 2017 release, the new versions are — surprise surprise — likely to get a strong reaction, and beat out last years Pirelli collaboration on the quantitative front. 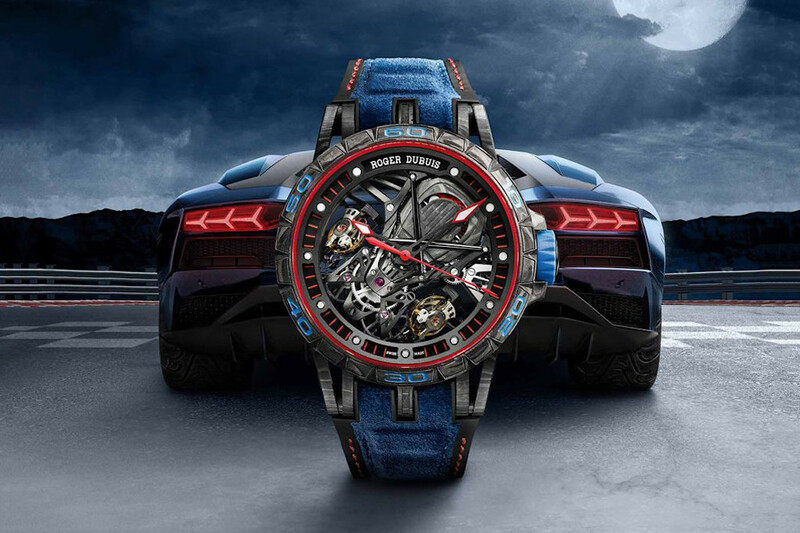 In blue, 88 pieces of the Aventador S will be available for wide release, featuring a racing red chapter ring and suspended movement (both of which pay homage to Lamborghini’s infamous supercar). The vehicular motif is echoed in the watch’s material provenance: with body grade C-SMC carbon utilised in the model’s case, bezel and dial. The Aventador S in pink gold represents the eponymous collection’s most coveted model, limited to a run of 28 pieces. For those craving a timepiece in the mould of last year’s flying tourbillon, the aforementioned Aventador S in pink gold may prove more alluring — limited to a spartan production run of 28 pieces. 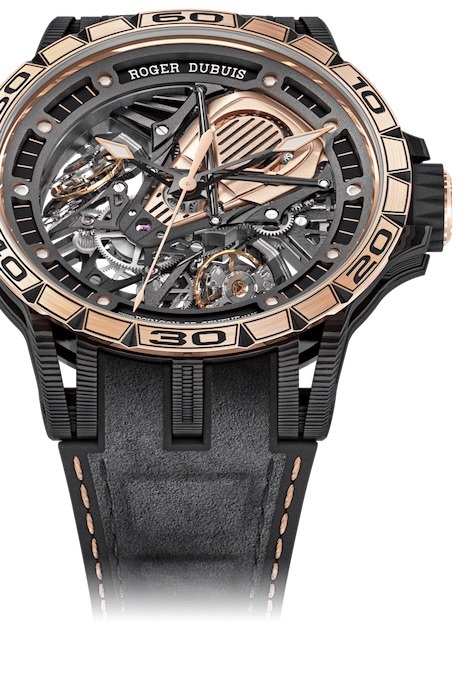 From top to bottom, the execution of this model is pure Roger Dubuis. Produced in a large-scale 45mm format, the watch features a multilayered carbon case which has had its protective qualities enhanced by selective application of black rubber and titanium. The sports car imagery is further emphasised in the Aventador S’s accompanying strap: made from black rubber inlaid with Alcantara (i.e. a textile frequently used in Italian supercars). Viewed in top-down profile, the calibre RD103SQ powering the new Aventador releases is immediately reminiscent of a Lamborghini engine block. Both colourways of the new Aventador S are powered by a manual movement developed in-house — the calibre RD103SQ. What’s most immediately striking about this calibre is how it evokes the imagery of the Lamborghini Aventador: viewed in top-down profile, the design features a mainspring cover decorated with grooves reminiscent of an open engine hood. The RD103SQ is also a direct descendant of the Quatuor, swapping out four balance wheels for two. As with its predecessor, these are angled perpendicular to one another, connected using a differential and (to the Roger Dubuis design team’s thinking) help the Aventador S to perform more precisely by employing 45 degree axes of rotation. The sophistication of this movement is such that the differential connector is also used to transfer energy to a jumping seconds mechanism. (The latter feature was incorporated following customer feedback expressing dissatisfaction at the lack of a seconds hand on the Quatuor movement.) It’s a smart refinement on an already imaginative watchmaking exercise. The nods to Lamborghini? That’s just icing on the cake. To find out more about the Lamborghini Squadra Corse releases, visit Roger Dubuis.